The Hole in the Ground is a 2019 horror thriller film directed by Lee Cronin, from a screenplay by Cronin and Stephen Shields. The film stars Seána Kerslake, James Cosmo, Kati Outinen, Simone Kirby, Steve Wall and James Quinn Markey. The story follows a young woman who begins to suspect that her son's disturbing behavior is linked to a mysterious sinkhole. The film had its world premiere at the Sundance Film Festival on 25 January 2019. It was released on 1 March 2019, by Wildcard Distribution in Ireland and by Vertigo Releasing in the United Kingdom. Sarah flees to the Irish countryside. It's implied that she is fleeing an abusive husband, with whom she's had a son. The house she has rented is next to a forest, which in its centre houses a large sinkhole. When the two arrive in the village, Sarah almost has a collision with an old woman standing in the middle of the road, whose husband comes to take her back to their house. Later, Sarah has another encounter with the old woman, who tells her that her son is 'not your son'. The old woman is murdered in a mysterious way, with her head buried in the dirt, and Sarah attends her funeral, which is open casket. The late woman's husband tells Sarah that she believed their son, James, was not really their son, and that she could tell whether it was her son by looking at his reflection in the mirror, which she did obsessively. Sarah begins to believe that her son isn't hers, either. Eventually, Sarah ascertains that her son is a changeling, and her son's Doppelgänger, and enters the hole in the ground to retrieve her original son after the Doppelgänger tries to kill her. She locks the Doppelgänger in the basement of her house. She retrieves her son, burns the house down, then drives to the city, where she lives with her son in a heavily mirrored flat. Her son appears to be back to his normal self. Filmed in Enniscrone, County Sligo In December 2018, A24 and DirecTV Cinema acquired U.S. distribution rights to the film. That same month, Vertigo Releasing acquired U.K. and Irish distribution rights to the film. It had its world premiere at the Sundance Film Festival on January 25, 2019. It was released in the United States and Ireland on 1 March 2019. On review aggregator Rotten Tomatoes, The Hole in the Ground holds an approval rating of 89%, based on 65 reviews, and an average rating of 6.67/10. 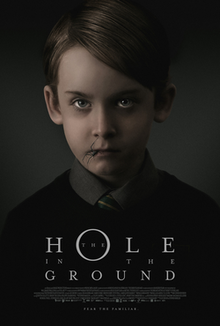 It's consensus reads, "The Hole in the Ground artfully exploits parental fears with a well-made horror outing that makes up in sheer effectiveness what it lacks in originality." On Metacritic, the film has a weighted average score of 63 out of 100, based on 16 critics, indicating "generally positive reviews". ^ "The Hole in the Ground". Sundance Film Festival. Retrieved January 25, 2019. ^ Donnelly, Matt. "A24, DirecTV Acquire Sundance Horror-Thriller 'The Hole in The Ground'". Variety.com. Archived from the original on 5 December 2018. Retrieved 23 January 2019. ^ Grater, Tom (6 December 2018). "Sundance-bound 'The Hole In The Ground' sells internationally including UK (exclusive)". Screen International. Retrieved 25 January 2019. ^ Loughrey, Clarisse (30 November 2018). "Sundance Film Festival line up: Highlights from Ted Bundy to documentaries about Harvey Weinstein and Alexandria Ocasio-Cortez". independent.co.uk. Retrieved 23 January 2019. ^ Murray, Suzanne (January 11, 2019). "The Hole In The Ground To Open in Cinemas Across Ireland and the UK on 1st March". Wildcard Distribution. Retrieved January 25, 2019. ^ Miska, Brad (13 December 2018). "A24's 'The Hole in the Ground' Coming in March 2019". Bloody-Disgusting.com. Retrieved 25 January 2019. ^ "The Hole in the Ground (2019) - Rotten Tomatoes". Rotten Tomatoes.com. Flixter. Retrieved March 2, 2019. ^ "The Hole in the Ground reviews". Metacritic. CBS Interactive. Retrieved March 2, 2019.